Fluffy potatoes, made from scratch with mash and choux pastry, then fried. They have a crunchy outside and a soft inside. Hmm, lovely pommes dauphine! PEEL the potatoes and slice them into chunks. COOK the potatoes in water with salt for about 15 minutes until they’re fully cooked, you can check that easily by poking them with a fork. Cooking time will depend on the size of your potato chunks. Meanwhile slowly heat milk and butter in the medium-sized pan. SIFT the all-purpose flour and add it all at once into the warm milk and butter. STIR it well with a wooden spoon and let it cook on low heat for about 2 minutes. You will notice it will become a smooth kind of batter very soon. Turn off the heat and let it cool off a bit. DRAIN the potatoes and create a smooth puree. The best way to do this is pressing the potatoes through a fine sieve using a ladle while they’re still hot. Bring them to taste using pepper, salt and ground nutmeg. Keep in mind you will be adding the choux pastry later on so use enough seasoning. Let the plain puree cool off a bit, you can now PRE-HEAT the frying oil to a temperature around 175 degrees celsius or 350 degrees fahrenheit. 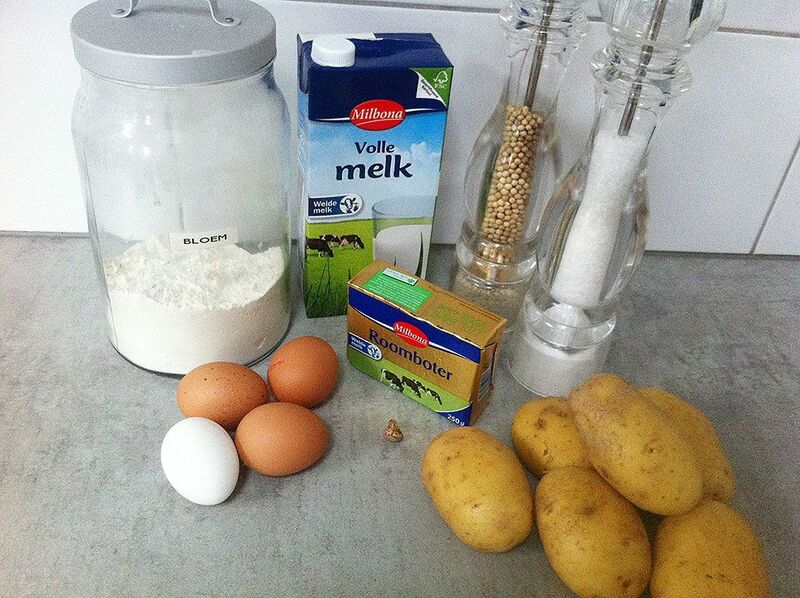 MIX the eggs one by one to the milk, butter and flour batter. It’s important to add the next egg when the egg is fully incorporated. Now you’ve created a hearty choux pastry. Easier than you thought, right? If you don’t have a thermometer, you can check if the oil is hot enough with a small piece of paper kitchen towel. When it starts to bubble, it’s ready. 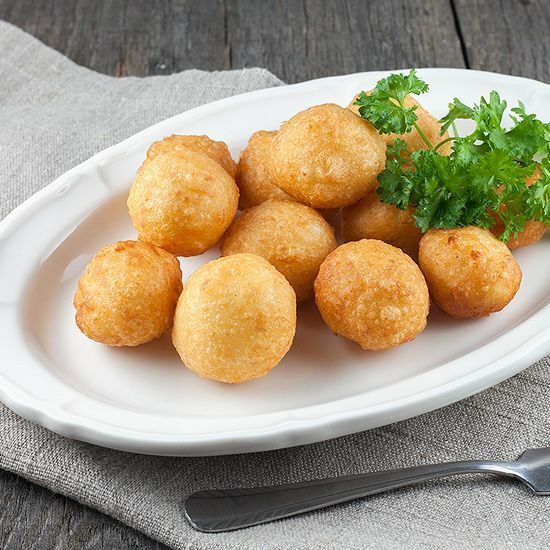 COMBINE the puree and choux pastry and use your hands to form small balls. Carefully slide them into the hot oil, don’t overcrowd the pan. 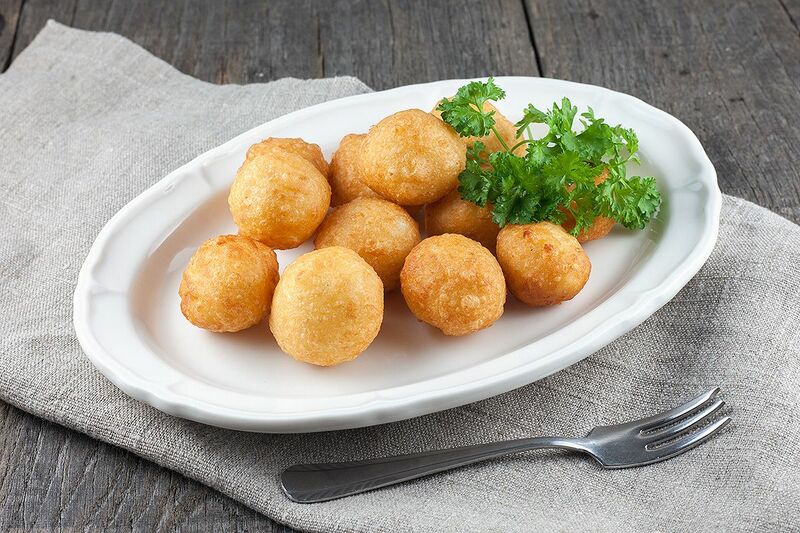 FRY the pommes dauphine for 3 to 4 minutes, depending on the size, or until beautiful golden brown. 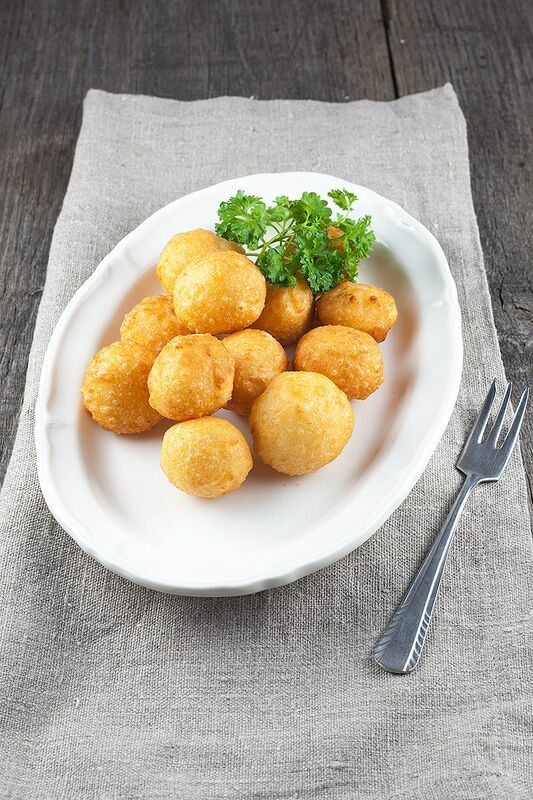 Enjoy these lovely fluffy pommes dauphine! Did you know you can also use the same recipe for potato waffles? You only have to add the mixture to a waffle iron instead of the frying oil. They look amazing and taste awesome! Wow, looks really yummy! Thanks a lot sharing. Can we bake them in the oven instead?